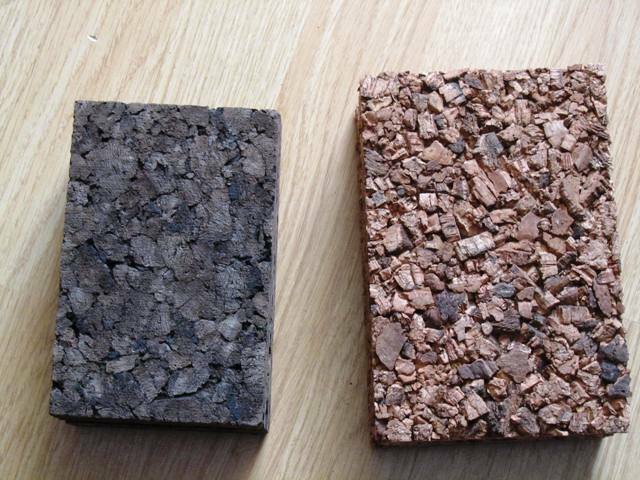 There are two great options for cork insulation boards that have some different properties as well as a different appearance, but both offer a natural way of providing acoustic and thermal insulation. The traditional solution is expanded cork, which is 100% natural and is made by super-heating cork granules which forces them to expand and release their resin, which then forms a bond to bind the granules together. Expanded (or black) cork is a fantastic insulator first because of all the air trapped inside the cork granules and second because it is 100% natural. One drawback it has is that it is a little brittle, so can be damaged by friction or some kind of impact. There is an alternative to expanded cork board which retains the natural properties of large cork granules and the attractive appearance, but is more robust – these are boards made out of large (2-14mm) cork granules that are bound together to make boards, which can either be used in wall cavities or left visible on internal walls, where as well as giving an attractive natural finish, can also be used as a cork notice board for pins etc. These boards are available in 10, 20, 30, 40, 50 and 60mm and can either be given a sanded flat finish, or be left with their natural rough surface. The standard board size is 100x50cm. You can see here the two different options, with the darker expanded cork on the left and the course granule standard cork on the right. In terms of insulation, the expanded cork gives 0.040 W/m.K compared to 0.045 W/m.K for the standard cork. The density of the expanded cork is 120 kg/m3 compared to 170 kg/m3 of the standard cork. For more information on cork insulation boards please contact us.